I didn’t even know about Courbet’s Pavilion of Realism! But perhaps it is not unknown. Lots of French artists found their work rejected by Academy juries or juries from Exposition Universelles, and they responded in different ways. But how clever of Courbet to set up his own tent, to display his own works near the World Fair grounds. And how clever to be ideological about new ideas in art – visitors might well have read his catalogue and manifesto. The only problem was that World Fairs got endless truckloads of advertising. Individual protest tent pavilions would have got none. The thing about Manet is that he’s not unconventional enough to tell the Salon and PTBs to jump off a cliff, and he’s not good enough (I say it with love) to be accepted by said powers, so he’s kind of always bitter about being shut out of the official exhibitions and salons. He believes in the Salon and wants to be a part of it, but he’s destined to be the front runner of the avant-garde. Thank you for this most interesting post. 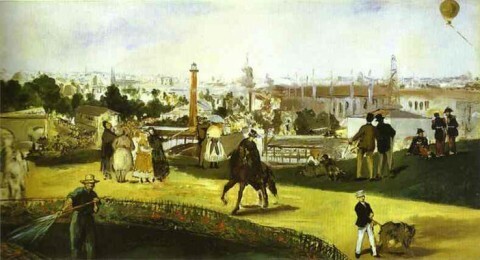 I knew about Courbet’s pavilion but not Manet’s. I wondered why he didn’t complete ‘A View of the 1867 Exhibition Universelle’. Maybe it was the fact that it was so contrived, to impress the establishment that disillusioned him. An earlier work ‘La Peche’ (1862-3) is also contrived, a wedding picture where Manet in 17thC costume portrays his unorthodox domestic arrangements with his future wife. Like ‘Universelle’ it also features his son Leon and seems to use a similar palette (I haven’t seen the picture, you probably have). Maybe he just thought it was too like something he’d done before and abandoned it…we shall never know. Many thanks for this interesting post! I was not aware of Manet’s pavilion just about Courbet’s.You might be interested this: Courbet’s works and his pavilion were so inspiring that after seeing them, a young Hungarian painter – who was at the time studying in Dusseldorf – made a later golden medal winning (on Paris Salon) painting. And soon he became a famous artist in Europe and in the States. Unfortunately his name – Mihaly Munkacsy – is mostly known nowadays in Hungary. However one of his painting hangs on the wall of the New York Public Library. Again thank you for your informative writing! I love it when students bring new insights based on their research to class. Looks like you can share a wonderful validation with your Manet student too! Hi everyone! Thank you for your comments! It’s interesting to see that several of you, like me, were not familiar with this pavilion. Heidenkind, I’m not surprised that you knew about Manet’s pavilion, since you are so interested in Manet. Zsofia, I had never heard of Mihaly Munkacsy before reading your comment, although I have been to the New York Public LIbrary several times! I will look for his painting the next time I go there. Thanks for sharing that information about him and his experience visiting Courbet’s Pavillion of Realism. What a neat story! Manet’s pavilion is discussed in Chapters 20 and 21 of Ross King’s book, The Judgement of Paris (which I’m currently reading). Manet invested time, effort and a great deal of his mother’s money in the venture but, as you said, most of the critics ignored his show and the public stayed away. All the paintings on show remained unsold. 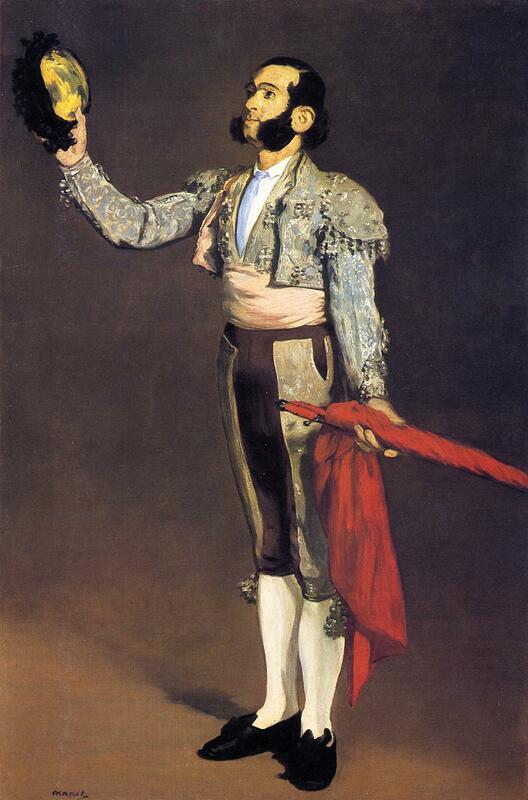 Courbet, having also been excluded, was at the same time staging his second one man show to coincide with the Exposition, also with little success. Both Courbet and Manet’s efforts were completely eclipsed by the critical and commercial triumph of Ernest Meissonier, the most famous artist of the day, at the Exposition proper. From what I remember of last year’s Manet exhibition in London, quite a number of his paintings were never finished and remained in his studio until his death, possibly because there were so few buyers interested in his lifetime. Hi Anne! Thanks for your comment and the reference to Ross King’s book. I have been meaning to look into that book, and now I have added reason to read it! According to this site, Courbet had nine paintings accepted by the official exhibition in 1867, but he still chose to exhibit 140 other works in a building constructed on the Place de l’Alma. In terms of size, then, Courbet’s second exhibition was much larger than Manet’s show, since Manet’s pavilion showed fifty works of art. Thank you for this platform for sharing art/history!